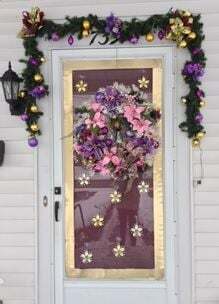 Peter Murinka's decorated front door in Owasco. The Christmas decorations for 2018 are all put away for the season. Owasco homeowners took advantage of the several mild days before and after Christmas to put out their decorations and then take them down. I know I did. We all missed seeing the lights covering the roof and sides at the “gate house” or the “gingerbread cottage” on the corner of Melrose Road this year. Farther up the street, the big spruce in front of fire house No. 1 was not lit, and the showy musical display in the Atkins' front yard was absent too! Media concern and comments on the website ”You know you’re from Auburn … If” flew back and forth as Christmas drew near. Where were the decorations everyone enjoyed as they traveled up Owasco Road? What was wrong? Bob Bruno, our Owasco Highway superintendent, was able to find the necessary equipment to finally raise the men high enough at the firehouse location. The problem was solved when they now could reach the top of the spruce so the multicolored lights could be strung around the tall tree. It was such a welcome sight to see it lit! The other decorators cited health reasons for not doing their yearly light shows. Peter Murinka of 7397 Owasco Road not only decorates his entire home for Christmas, but his outdoor ”Welcome To Owasco“ tributes are visible throughout the year. His porch is always well lit with seasonal greetings. The picture shown here, taken by his neighbor Beth Morabito, captures his talent for decorating. The display continues indoors. Each room is festooned with his 40-year collection of handmade ornaments and celebration material. He also told me his favorite season was Easter. He asked me if I remembered working with him for the display of his hand-painted Pysanka eggs. They were contributed for the many cultural exhibits sponsored by the Cayuga Museum for the Bicentennial of America in 1976. We both have been doing displays for a very long time! I was working with Sheila Tucker (the Fleming historian) gathering material on the Dutch families of Owasco, Fleming and Auburn. I did not become the Owasco historian until 1980. I had forgotten, for that was 43 years ago, but Peter hadn’t! Over the years, the collections grew. He said the attic was full with narrow aisles separating the collections, with items even hanging from the ceiling. The cellar is full too. The picture shown here only shows the Christmas theme. Can you picture Easter, July, Thanksgiving too? This talented, expressive man is generous too. Visitors to the Owasco Town Hall will see the floral bouquets he has made for each holiday on the desk. The staff has their own collection of his handiwork, for Peter has made us each colorful plastic canvas pins to wear. Next time you drive on Owasco Road, just past Havens Avenue where the town of Owasco begins, look to your right and the Murinka home. Peter Murinka is busy getting ready for Valentine's Day. Laurel Auchampaugh is the Owasco historian and can be reached at the Owasco Town Hall from 1 to 4 p.m. Tuesday afternoons or at historian@owascony.gov.